Hungarian is spoken in Hungary and by the Hungarian minorities in 7 neighboring countries. The Hungarian name for the language is Magyar. 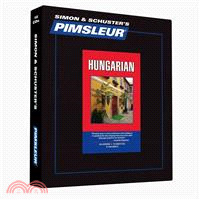 Pimsleur's Hungarian teaches the "standard" Hungarian, which is based on the North-Eastern dialect spoken throughout Hungary. The PimsleurR Method: the easiest, fastest way to learn a new language. Completely portable, easily downloadable, and lots of fun. You’ll be speaking and understanding in no time flat! Hungarian, Comprehensive includes 15 hours of spoken language practice and one hour of reading instruction in thirty, 30-minute lessons.